One of the summer traditions in Phoenix is unfortunately forest fires to the north of the city. At this point, the big one is called the “Willow” fire. 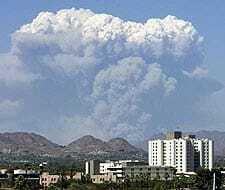 Firefighters have set controlled burns that have expanded the size of the fire to 65,000 acres–a real monster, large enough now that the plumes are visible from downtown Phoenix 60 miles south of the fire. The big building to the lower right of the image is the hospital where Andrea was born.